We have five different sizes and layouts for our rooms. There are 1 studio, 2 one bedroom units, 1 two bedroom unit & 1 three bedroom unit to choose from. 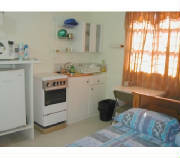 Each unit is fully equipped including microwave oven, satellite TV and Air Conditioning throughout.